The Times provides a weekly look at the Seahawks' competition in the NFC West, where the Los Angeles Rams open the 2018 season as Super Bowl contenders. If the Seahawks hope to win their division in 2018, they’ll first have to go through the Cardinals, Rams and 49ers. Each week, we’ll monitor the Seahawks’ competitors in the NFC West. Away we go. This week: vs. Washington, 1:25 p.m. Notable: The biggest news for Arizona this offseason is that standout running back David Johnson is back after missing 15 games in 2017 due to a wrist injury. The offense will revolve around Johnson and journeyman quarterback Sam Bradford, who won the job despite previously missing 48 games in his NFL career due to injury. On the other side, it’s unknown whether defensive end Markus Golden — who went down with a torn ACL last season — will be ready for the opener against Washington. The Cardinals finished 18th in the NFL with 37 sacks last season. This week: at Oakland, 7:15 p.m. Notable: The Rams finished 11-6 last season, and it appears they’re even stronger in 2018. The team added defensive tackle Ndamukong Suh, cornerbacks Marcus Peters and Aqib Talib and wide receiver Brandin Cooks this offseason. 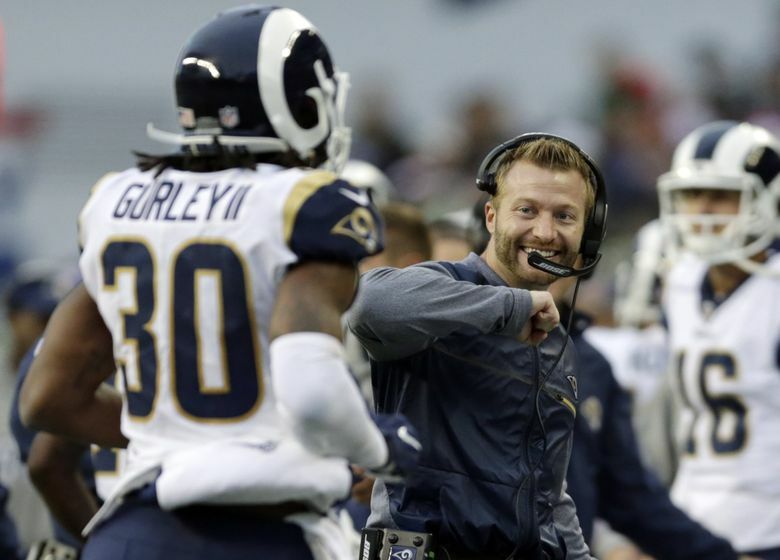 The Rams’ most impactful moves, however, may have been reaching contract extensions with standout running back Todd Gurley and defensive tackle Aaron Donald. Quarterback Jared Goff is looking to take another positive step in Year 3. The Rams are talented and, most importantly, healthy heading into their opener against Oakland on Monday night. They’re also a potential Super Bowl contender. This week: at Minnesota, 10 a.m. Notable: The 49ers opened the 2017 season with nine consecutive losses and closed it with five consecutive wins. So which team will show up on Sunday? A lot of that will depend on 26-year-old quarterback Jimmy Garoppolo, who enters his first full season as a starting quarterback. The 49ers drafted offensive tackle Mike McGlinchey to protect him and signed cornerback Richard Sherman — ever heard of him — to terrorize opposing wide receivers. The hype train has officially left the station in San Francisco. Still, there still might not be enough talent on the 49ers’ roster to maintain that positive momentum, especially against perhaps the NFL’s premier defense in Minnesota on Sunday.